There’s something for everyone at Crouch Valley. There is an event for all to enjoy either as a participant or a spectator. Our club calendar is packed with weekend events from early May to late September with a broad range of activities. Including the monthly meetings that we hold with activities at every meeting, you can see there is always something happening. 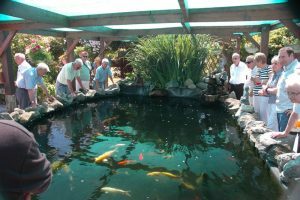 Each year we link up with other Koi Clubs in nearby areas to organise coach trips to visit them and in return we open our ponds for them to visit to us. Inter-Club Pond Visits: Club members to visit some of the ponds in the club on our Open Ponds Day which also ends with the club annual BBQ. 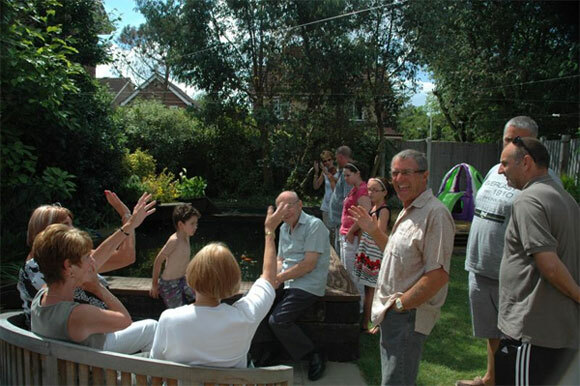 Local Pond Visits: Each year we also organise local visits whereby several members open up their ponds for any local members to visit, this is a very popular event. National Show: BKKS National Show and Dinner Dance, take trips to the Holland National Show in August. Closed Show: Our Closed Show is growing in popularity with members and competition is high. Some of our members also compete in other local open shows and at the National and of course many members go along in support. Koi Auctions: Our very successful Koi Auctions are held twice yearly and are enjoyed by members and visitors alike in the search for the extra ‘jewel’ to sparkle in their ponds. Grow & Show: Each year we buy a batch of Tosai which our members grow on and show off the results one year later. Each year is a different variety. Photo Competition: Our Annual “Photographic Competition” is held later in the year and gives our members a chance to show off and win prizes. Monthly Meets: – We have monthly meetings throughout the year with a good variety of guest speakers, forums and competitions.